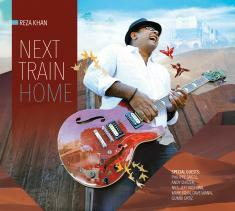 NEW YORK CITY (5 April 2019): Globetrotting guitarist Reza Khan dropped his fifth album, "Next Train Home," on Friday. The twelve songs that he wrote and produced for the collection symbolize the discovery of his musical home, a multi-genre and multicultural mélange of straight-ahead and contemporary jazz enriched with world music and Brazilian jazz nuances. The album has already climbed into the top 100 on the Jazz Week chart based on radio spins from jazz radio stations while the smooth/contemporary jazz single, "Drop of Faith," featuring guitarist Nils, has earned most added honors on the Billboard chart. The Bangladesh-born Khan "daylights" as a program manager for the United Nations, playing a role in peace and conflict operations throughout Europe, Africa and the Middle East. He composed the album during a six-week trek abroad, a trip that included a hospitalization and a forced recovery period after collapsing and suffering from severe dehydration. While traveling, Khan totes in his backpack a folding guitar, a primitive keyboard and a laptop that were used to write and record the material. When he returned to his New York City home, he fully fleshed out his concepts and ideas in the studio where he was joined by an array of first-call session players and prominent soloists. In addition to Nils, Khan called upon saxophonists Jeff Kashiwa and Andy Snitzer, keyboardist Philippe Saisse, pianist Matt King, bassist Mark Egan, horn man David Mann (sax and flute), percussionist Gumbi Ortiz, and drummers Mauricio Zottarelli and Graham Hawthorne to meticulously craft the lush tracks heard on "Next Train Home." At the core is Khan's deft nylon and electric guitars plucking lofty melodic statements and strumming harmonic passages with verve. When soloing, he astutely bends notes, indulging his imaginative wanderlust and impulse to riff evocative etchings. While Khan gears up for an album release concert at the City Winery in New York City on May 9, he's begun making the media rounds in support of "Next Train Home." Recently he was interviewed on internet radio show Hybrid Jazz and for the summer issue of national jazz magazine Jazziz.